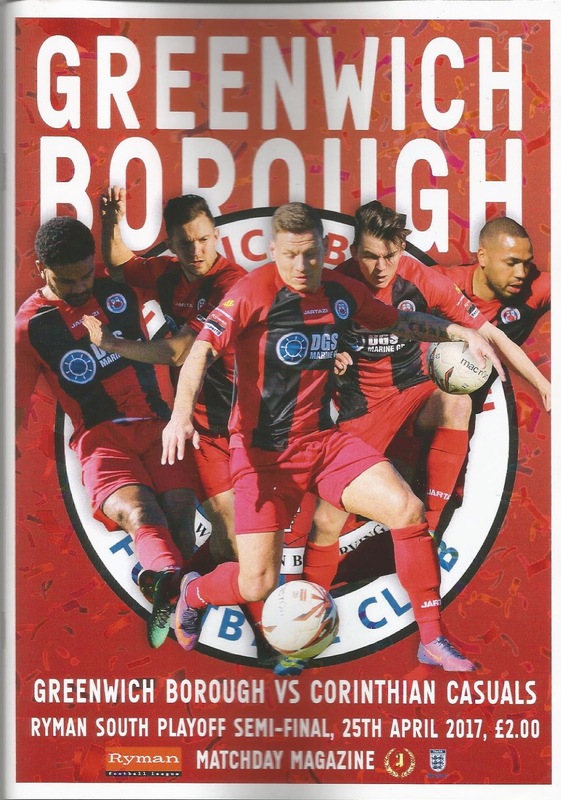 Greenwich Borough FC is a non-league football club based in south-east London who were formed in 1928 as Woolwich Borough Council Athletic Club, playing in the Woolwich & District League and becoming champions in their first season playing at Danson Park in Welling. In 1929 the club became members of the Kent County Amateur League, before moving to Harrow Meadow in 1937 and leaving to join the South London Alliance for the 1949-50 season. Consecutive promotions in the mid 50’s saw the club reach the league’s Premier Division. Borough went on to win the Premier Division title in six successive seasons from 1960–61 to 1965–66. Following a change of London Borough boundaries, the club became known as London Borough of Greenwich FC for the last of the title wins. A seventh South London Alliance Premier Division title was accrued in 1973-74, leading to a move to the London Senior League. 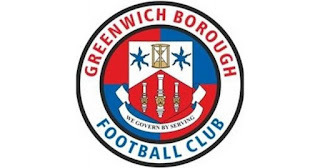 Winning the Senior Division in 1979-80 led to promotion to the Premier Division as the club changed their title to Greenwich Borough FC. Borough were transferred to the Kent League for the 1984-85 campaign with future Arsenal and England striker Ian Wright playing up front before Crystal Palace spotted him. Greenwich became league champions in 1986–87 and 1987–88 as well as lifting the League Cup on a couple of occasions. The club were denied promotion because their Harrow Mead ground didn’t match the ground grading criteria. Borough decamped to Erith & Belvedere’s Park View home for the 1988-89 season, while works were carried out on their home venue. Harrow Mean was sold to property developers in 2008, with the club moving to share with Holmesdale FC. 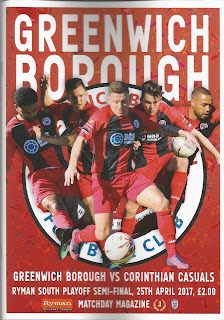 Greenwich finished bottom of the Kent League in 2011-12 before the league was renamed the Southern Counties East League for the 2013-14 season as the club moved in with Dartford at Princes Park. New owners arrived at the club with David Skinner providing the money to his brother Perry to run the club as chairman to enable the move as they searched for a new home ground back in the borough of Greenwich, while the team was managed by Ian Jenkins. Borough submitted plans to rejuvenate football grounds at Avery Hill in Eltham in June 2015 as former regular Football League goalscorer Gary Alexander was appointed as manager to replace Jenkins, after the team ended in fourth place in the league. Alexander’s team went on to lift the Southern Counties East League title and promotion to the Isthmian League in 2015-16 as the playing budget was extended. In the summer of 2016 the club signed a thirty year lease to share the Badgers Sports Ground with Cray Valley PM FC. In the 2016-17 season Borough took to their new status instantly and ended the campaign in third place to qualify for the play-offs. In the semi-final at the Badgers Sports Ground Greenwich went down 4-3 to Corinthian Casuals. 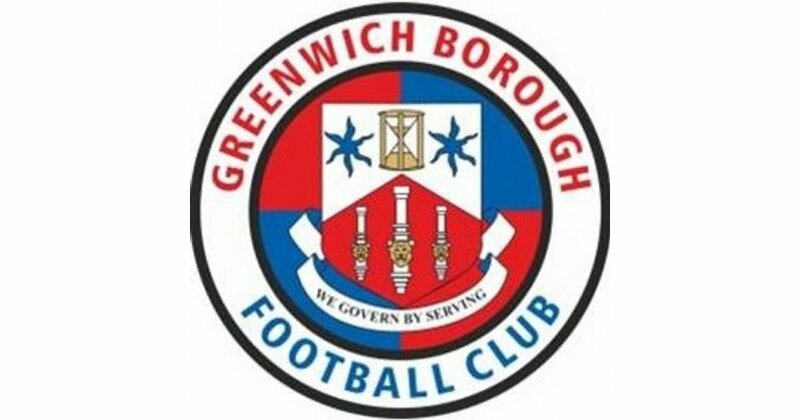 Greenwich Borough FC will play in the Isthmian League Division One South in the 2017-18 season. On a day off from work I ventured to south east London and Kent to visit some grounds and update my photo collection. Having been to Welling United I took a bus to Sutcliffe Park, where the Harrow Mead ground was located. A gent let me go in through the rather messy clubhouse which led me behind the goal where there was a couple of small covers. There was a small seated stand up on the left hand touchline, but the rest of the arena was all flat open standing. To be honest, it wasn’t difficult to see why the Southern League had turned down the venue. It was showing sign of age and desperately needed a tidy up. Despite that, it was nice to be offered a welcome. I departed to take public transport to head over the river towards Mile End to take a look at the home of Bethnal Green United. My pal Tony Foster texted me on the morning of the match with the news that he’d wavered after not been too interested a few days before, and fancied heading over the river. I was pleased with his decision as I enjoyed the play-offs and heading to new grounds. We met up at Wembley Park before heading to London Bridge to catch the packed service to Eltham. As we were getting off the train we got chatting to John, a Casuals fan who ran the club shop and was trying to give the club’s profile a boost. John was a good bloke. A Huddersfield Town fan on the side, he told us all about his club while we walked down to the ground. Casuals players were still strictly amateur, which Tony and I found remarkable. The walk took us around twenty minutes after we took a wrong turning. It was still only 7.15pm when we arrived. The very smart social club outside the ground was doing a roaring trade. We got a pint each, with hand pumps dispensing a decent pint of ale before paying our £10 admission. We’d already bough the £2 programmes in case they ran out. The Badgers Sports Ground had a slope across the pitch. There was a seated stand opposite a small covered enclosure. The remainder of the ground consisted of flat open standing. The pitch looked in poor condition considering Borough had spent a lot on it the previous summer. I was pretty sure that I’d played on the ground before? If I was correct it belonged to Eltham Town FC when I played in a veterans team for a season and a bit with Dave Cammish. It had certainly received some work on it since then. Casuals had a very vocal following with a fantastic array of flags and banners. They were not dislike the support of Dulwich Hamlet only lesser in number. It wasn’t easy to get a good vantage point. We went over to the far side. Within a few minutes Greenwich were ahead when Mohamed Eisa benefitted from the atrocious playing surface as his shot from the edge of the box hit a divot and bounced wickedly over keeper Danny Bracken and into the net. Casuals were level on eighteen minutes when a late challenge sent Mu Maan sprawling in the box. Shaun Okojie sent the keeper the wrong way from the spot to make it 1-1. We moved to the other side of the pitch at that point as the wind was becoming bitter as it blew from the Thames. We’d only just taken up our position when Casuals’ midfielder Coskun Ekim was shown a straight red card for a high challenge. The general consensus seemed to be that the referee had maybe acted a bit hastily and the player was unlucky. The visitors front two continued to cause problems with their pace and skill. They went ahead when Reyon Dillon had a shot deflected into his own net by a Borough defender. Ten minutes before the interval it was 2-2 when Peter Sweeney scored with an exquisite free kick. At the break we headed to the snack bar in the top corner, where hot drinks were the order of the day. It was good to see a club prepared for a large crowd and having enough staff to manage. Too often opportunities are lost, as disgruntled punters head off at the site of queues. The visitors went ahead once again around ten minutes after the break. Maan saw his free kick deflected off the wall to leave Borough keeper Craig Holloway stranded. The visitors took charge of the game despite being a man light, keeping the home attack at bay expertly. Casuals made it 4-2 with fifteen minutes remaining when Okojie turned in a cross with style. He looked about the best player on show. Borough continued to press and they got back into the game with seven minutes remaining through Glenn Wilson. Despite plenty of pressure in the closing stages, Casuals held out with relative ease to win through to the final for a trip to Westhumble to take on Dorking Wanderers the following Saturday. The visiting supporters celebrated wildly with their players. As we were making our exit we bumped into some of Tony’s West Ham mates who also fancied the game. They were heading to Lee station but Tony convinced them that Mottingham was a better bet. What followed was the sight of several men over fifty years old walking, jobbing and doing their best to run as the station was far further than we thought. We managed to make the 10.05pm service, but only just. There was plenty of sarcasm and humour as we pulled into Lee, the next stop, where the others had intended to go to. They had a point! We took the Jubilee line train home from London Bridge to arrive home at 11.30pm after a cracking evening out.